WANT DETAILS ABOUT SEWER & VIDEO PIPE INSPECTIONS? ACS Underground Solutions specializes in the inspection of pipes, sewer systems and underground tanks using modular, remotely-operated systems and high-tech video equipment in New York, NY. 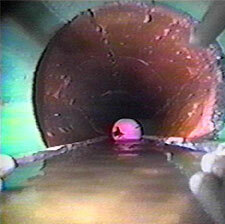 Sewer pipe inspection is a form of telepresence used to visually inspect the interiors of pipelines. Admiral Conservation Services (ACS) Underground Solutions is a privately owned consulting company that provides Sewer Pipe Inspection services to the New York, NY area. With modern video equipment, the interior of a sewer pipe may be inspected by this form of non-destructive testing. ACS Underground Solutions specializes in performing inspections of utility pipes, sewer systems, and storm drainage systems in New York, NY using modular, remotely-operated system and high-definition self- leveling camera equipment. From zoom cameras to inspection crawlers, video nozzles to digital push cameras and more, our technology inspects pipes of 17 mm to 8 feet in diameter and runs 750’ in length. For information about video pipe inspection, call today at 203.544.7190. Call us at 203.544.7190 or email us to learn more about our sewer and video pipe inspection service in New York, NY.